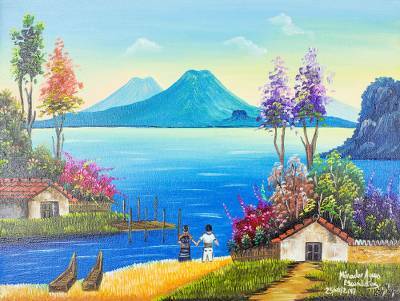 Signed Waterscape and Landscape Painting from Guatemala, "View of Agua Escondida"
Located in the southeastern region of Lake Atitlan, Agua Escondida is a small Guatemalan pueblo with an impressive view of crystalline waters. Edy Mayor paints from the town, using an impressionist style to depict the lake. In the foreground, a couple stands together near their country home, taking in the view of the volcanoes in the distance. Titled Mirados Aguas Escondidas in Spanish. You can find 'view of Agua Escondida' by Edy Mayor in paintings categories such as Landscape Paintings, Impressionist Paintings and Oil Paint Paintings. Enjoy exploring these sections for other Novica treasures.